Lazy weekend morning breakfasts always make me happy. They involve no rush because you generally have no where to go and you can really take you time in the kitchen and sipping your coffee and letting the younger ones help with mixing, pouring and stirring. Those mornings are perfect...they involve great, light conversation and lots of laughter and sometimes, it also involves a little batter on the floor. Oops - man down! So, as you are all aware (I am sure) ---IT IS FALL!!! The leaves have turned and most of them have left us, but the solid root vegetables and colorful gourds are still a plenty and the urge to create different things that taste of pumpkin has taken hold. The hint of cinnamon, nutmeg and ginger only add to the feeling that soon the snow will be falling and the decorations will be coming out of their 10 1/2 month hiatus in the garage. There will be entertaining and holiday get togethers and figuring out the best presents for those you love. 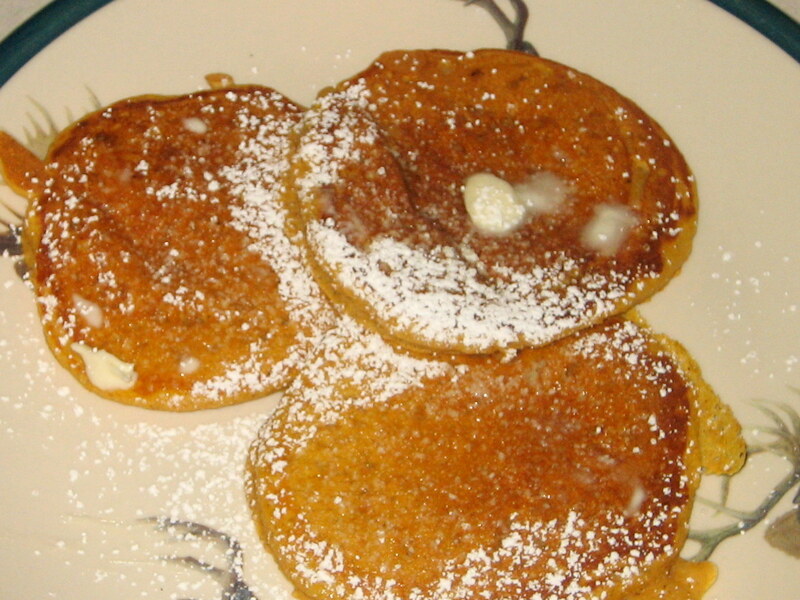 But before I jump too far ahead, let's enjoy this relaxing Saturday morning with some pumpkin pancakes. In one bowl, combine flour, baking powder, baking soda, cinnamon, nutmeg, ginger and salt. In a second larger bowl, combine eggs, brown sugar, pumpkin puree, milk and melted butter. Whisk until incorporated. Add the dry mixture into the wet mixture until combined. Heat your skillet or pancake pan of choice over medium-low heat and either melt butter or spray a little non-stick to prep for the batter. Pour batter on your pan and cook for a few minutes per side till each pancake is cooked through. Serve with maple syrup, butter & powdered sugar, or spice it up with dried cranberries, raisins and toasted walnuts or pecans with fruit flavored syrups. If the batter is too thick for your pancake liking, add a little more milk, 1 Tbsp at a time, till desired consistency is reached. This recipe can be turned into waffles as well by reducing the amount of milk to 1 2/3 cup and cooking per your waffle maker settings. If cooking with kids, it's time to be creative. The original round pancake is great, but see how excited for breakfast the kids will get when you bring a platter with a cactus and their initials shaped pancakes.